FFA - eHealth Services, Inc. owned Medicare.com is a leading advertiser on Al Jazeera America. Eighty one (81%) percent of respondents to Al Jazeera survey say they support ISIS. Click here to send email of concern to eHealth Services, Inc.
Medicare.com recently started advertising on Al Jazeera America. Florida Family Association tapes ten hours of programing on Al Jazeera America every day. The Florida Family Association office communicates with each advertiser no less than once per week. Medicare.com ads continued to air on Al Jazeera America after officials received several email communications from Florida Family Association. Medicare.com is a non-government web site that is operated by eHealth Services, Inc. In a recent survey conducted by AlJazeera.net, the website for the Al Jazeera Arabic channel, respondents overwhelmingly support the Islamic State in Iraq and Syria, with 81% voting “YES” on whether they approved of ISIS’s conquests in the region. 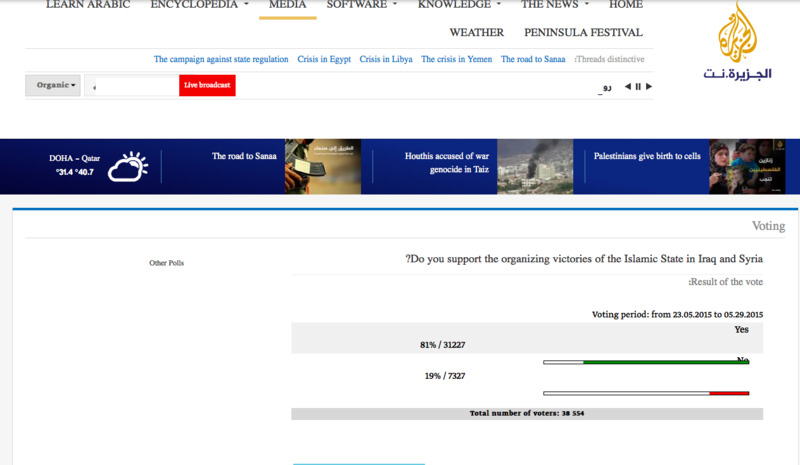 The poll, which asked in Arabic, “Do you support the organizing victories of the Islamic State in Iraq and Syria (ISIS)?” has generated over 38,000 responses thus far, with only 19% of respondents voting “NO” to supporting ISIS. · No other company poses a larger threat for the most American companies to start doing business with Islamist companies. · The news media does influence the political positions of the public. The Islamist political positions held by Al Jazeera officials and/or owner, especially those positions summarized below, pose a threat to changing American public policy that has protected life, liberty and the pursuit of happiness. · American companies that buy advertising with Al Jazeera America are giving United States consumer dollars to an Islamist Sharia minded regime. · Eighty one percent of respondents to Al Jazeera survey say they support ISIS. eHealth Services, Inc. certainly has the right to choose where they use their advertising dollars. You have the same right to object and choose to patronize other companies that won't give your consumer dollars to Al Jazeera. Florida Family Association has prepared an email for you to send to urge eHealth Services, Inc. officials to stop advertising Medicare on Al Jazeera America. Senior Vice President, Sales and Operations. President, Chief Operating Officer and Board Member. Officer and senior advisor of Bryan Cave Strategies LLC, an affiliate of the law firm Bryan Cave LLP. The email adresses for other board members were not available. Tags: Medicare.com, eHealth Services, Inc.